In baking, the major source of fiber originates from whole grains. Fiber is a carbohydrate polymer that cannot be digested. The type people can consume is called dietary fiber. Fiber is key in nutrition and an adequate amount daily intake is vital to digestive health. The rule of thumb for human consumption is that for every 1,000 calories consumed, 14 grams of fiber should be consumed as well, to maintain a healthy digestive system. Two terms, dietary and functional, denote certain characteristics of different types of fiber. 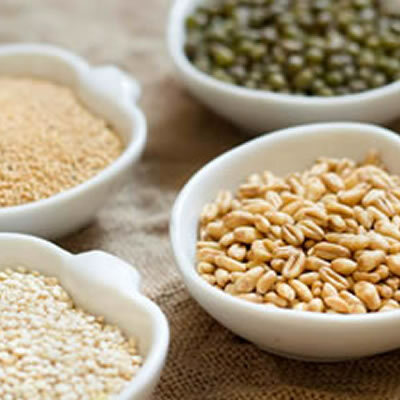 Dietary fiber is made up of the combination of non-digestible carbohydrates and lignin, including non-starch polysaccharides from a plant source such as cellulose and fiber, found in oat as well as wheat bran. American Association of Cereal Chemists (AACC) defined dietary fiber as the edible parts of plants or analogous carbohydrates that are resistant to digestion and absorption in the human small intestine with complete or partial fermentation in the large intestine.1 It is also called bulk or roughage. Soluble fiber can interfere with the absorption of dietary fat and cholesterol. This, in turn, can help lower low-density lipoprotein (LDL or “bad”) cholesterol levels in the blood. Soluble fiber also slows digestion and the rate at which carbohydrates and other nutrients are absorbed into the bloodstream. This can help control the level of blood glucose (often referred to as blood sugar) by preventing rapid rises in blood glucose following a meal. Insoluble sugar provides “bulk” for stool formation and speeds up the movement of food and waste through the digestive system, which can help prevent constipation.Both soluble fiber and insoluble fiber make you feel full, which may help you eat less and stay satisfied longer. The FDA suggests the Daily Value for fiber is 28 g per day based on 2,000 calories diet.3 Most Americans don’t get the recommended amount of dietary fiber. Dietary fiber is considered a “nutrient of public health concern” because low intakes are associated with potential health risks.3 Food with 5% Daily Value or less of dietary fiber per serving is low fiber, while food with 20% Daily Value or more of dietary fiber per serving is high fiber. The goal is to get 100% of the Daily Value for dietary fiber on most days. There are two types of dietary fiber3: soluble and insoluble. Soluble fiber dissolves in water to form a thick gel-like substance in the stomach. It is broken down by bacteria in the large intestine and provides some calories. Soluble fiber can be found in a variety of foods like beans and peas, fruits, oats, nuts and seeds, and vegetables. In baking, the major source of fiber originates from whole grains and the usage of whole grains in breads, muffins, crackers, and tortillas. Fiber originating from cereal grains is deemed “cereal fiber.” This is used in healthy breads or baked items to provide a more nutritious product. Whole-wheat bread flour, whole-wheat pastry flour, oat flour, or barley flour are sources of cereal fiber used in baking. Each imparts a sweet, nutty flavor to baked products compared to white flour. Bakers aiming to increase fiber content in baked products without imparting color variability can utilize resistant starch, maintaining a white or cream crumb color, concurrently with boosting fiber content. Resistant starch has a neutral taste, and a low water-holding capacity, resulting in an ideal flour replacement. In addition, resistant starch increases freshness of baked snack foods, batter, as well as maintaining crispness and increasing shelf life in breakfast cereals. Dried fruits and fruit pastes are also utilized in baking as a source of fiber, as well as a source of color and texture in muffins, breads, turnovers, bars, and crackers. In fat reduction, fiber can be used as a substitute. When substituting fat for fiber there are many advantages such as lower caloric content, longer satiety, and greater nutritious value. In addition, fiber can be used to retain moisture or add crispness. Tortillas or breads are often enriched with fiber for such functionality benefits. The research shows that for some parameters, such as proofing time, crust color acceptance, crust appearance acceptance, taste acceptance and aroma acceptance, fiber addition did not present a significant effect. But the high-speed mixing time, crumb color acceptance, crumb appearance acceptance and texture acceptance were influenced by the three different fiber sources studied. American Association of Cereal Chemists. “The Definition of Dietary Fiber: Report of the Dietary Fiber Definition Committee to the Board of Directors of the American Association of Cereal Chemists.” Cereal Foods World 46 (2001): 112-26. Almeida, Eveline Lopes, Yoon Kil Chang, and Caroline Joy Steel. “Dietary Fibre Sources in Frozen Part-baked Bread: Influence On technological Quality.” LWT – Food Science and Technology 53.1 (2013): 262-70. “21CFR101.81.” CFR-Code of Federal Regulations Title 21. N.p., 1 Apr. 2016.